The crabapple and apple trees were the first to bloom, bursting out in floor on a warm sunny day two weeks ago. The light was so golden, after days of rain, my husband walked around the yard taking pictures, trying to capture the light. You who are gardeners will be able to tell at once just how late our spring is. Here it is, June 25, and summer is only starting. Even for northern Minnesota, the bloom times this year are at least three weeks late. It's been that cold and wet and grey a spring - no sense even calling it early summer. But we're grateful the flowers are finally bursting out, though only a few so far. Dutch iris started to bloom less than a week ago. You can see some at the right, behind a dwarf Alberta spruce. The pink-flowered shrub is a northern-hardy azalea. 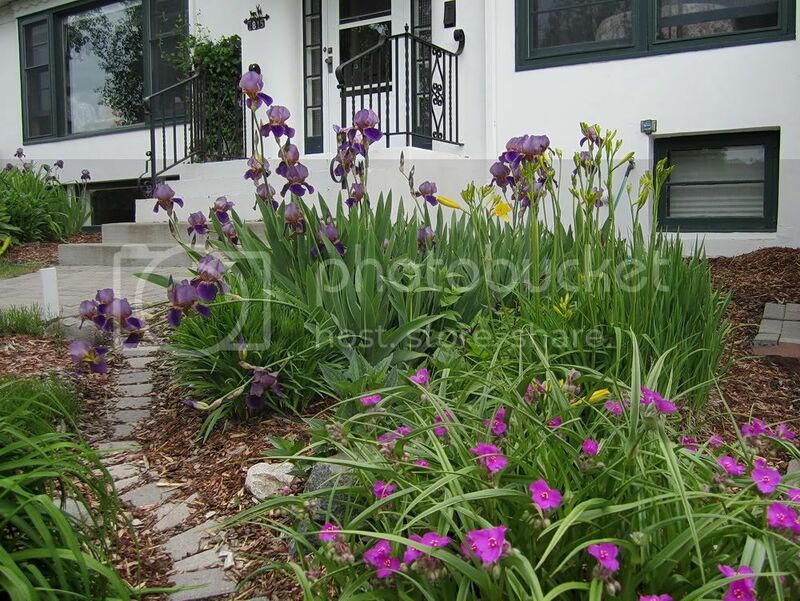 Here is another planting of dutch iris. The yellow day lilies in front of them, the earliest varietal of lilies I have, opened their first flower two days ago. The spiderwort, the bright pink-purple perennial in the foreground, started to open just after the dutch iris. 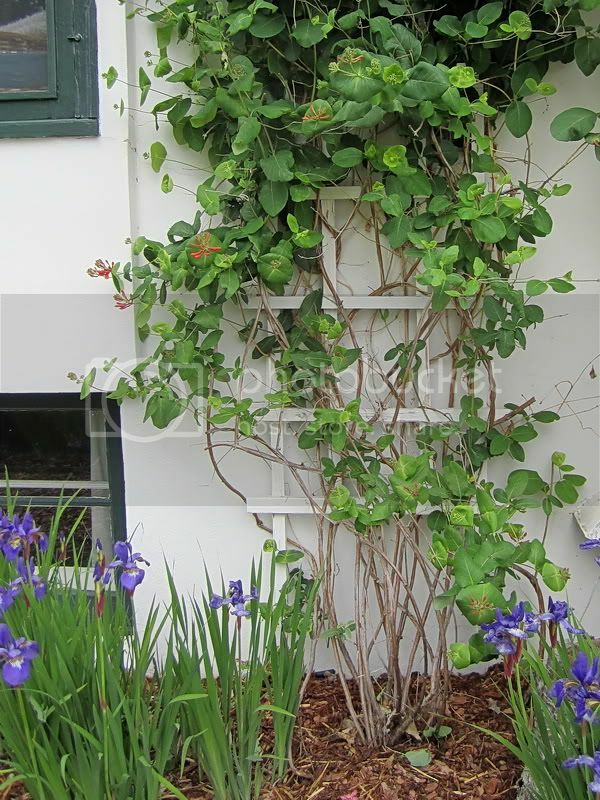 The Dropmore honeysuckle vine is showing its flame-orange buds, which should open any day. Below them, just opening yesterday, are blue-purple Siberian iris. By the big rock are a number of bushes. I love the Bridal Veil spirea to the right, set off by the deep red and purple of the thorned Crimson Pigmy and Cabernet varietals of Japanese barberry next to it. 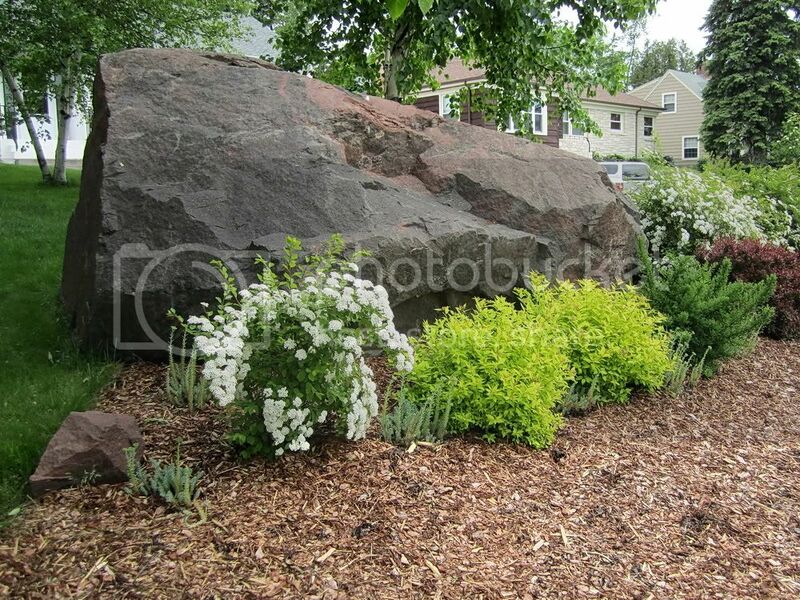 Here are two views of the shrubs taken from the front of the rock. To the left of the Bridal Veil spirea, the Crimson Pigmy barberry and the Cabernet barberry (only planted last summer), is a new Snowmound spirea, not yet in blossom. To its left are two low, round lemon-lime bushes. These are Goldmound spirea. 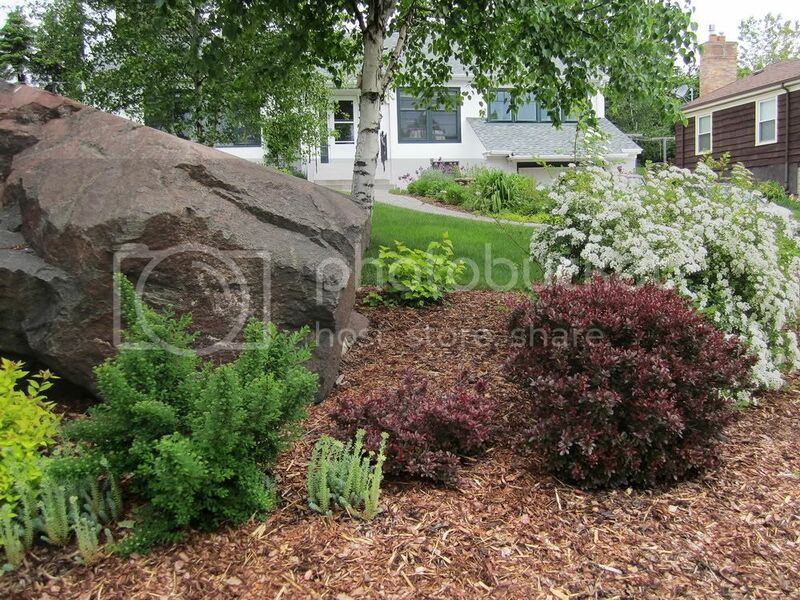 The white-flowering bush to the left of them is a new Firegold spirea. It's very like the Bridal Veil, but its leaves are a more yellow green, turning gold in the fall. 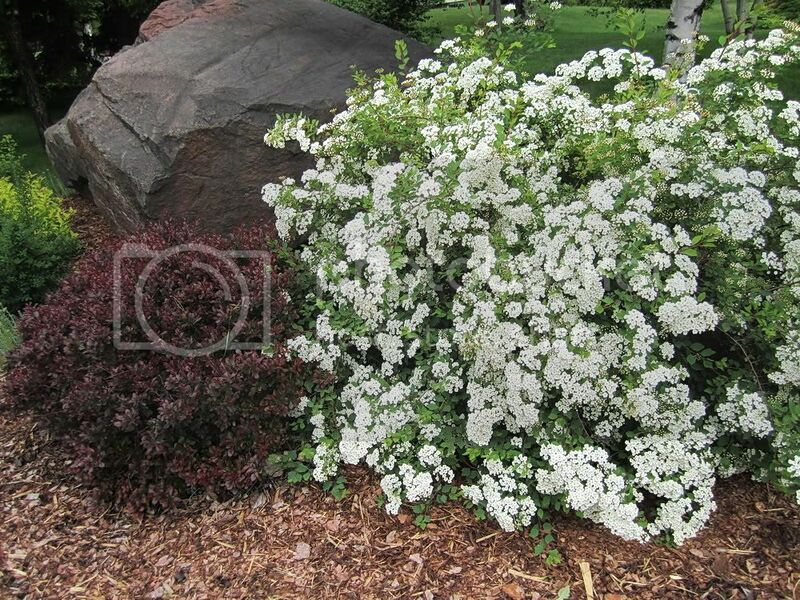 The spirea family is very diverse and very beautiful; I'm happy so many of them are hardy to our region. The little yellow-green leafy thing in the back of the bed in the top picture is what's left of our other Golden Nugget ninebark, cut back to the ground to try and revive it after last year's near fatal attack of some mystery mold. Below is my most vivid illustration, to gardeners, of the lateness of spring to our gardens. 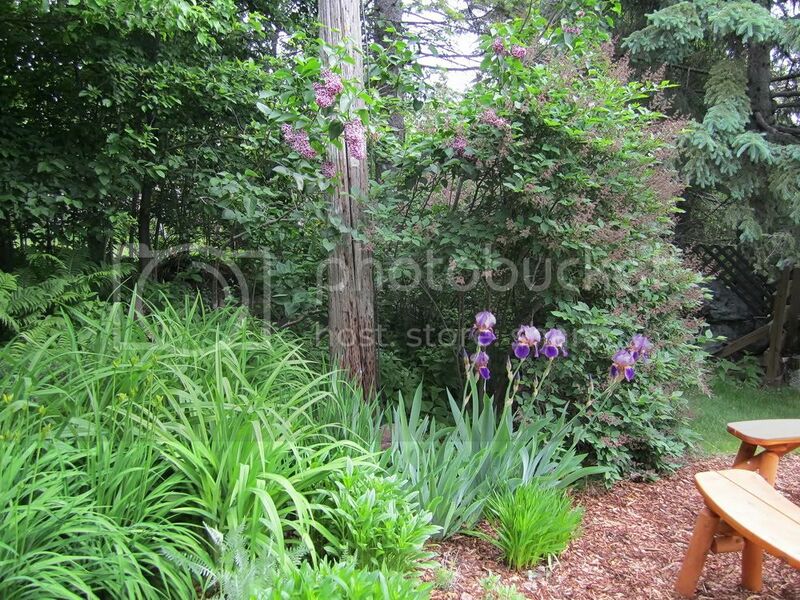 Behind the stand of dutch iris and to the left, the tall rangy bush with purple flower spikes is a french lilac (syringa vulgaris). It started blooming less than two weeks ago. 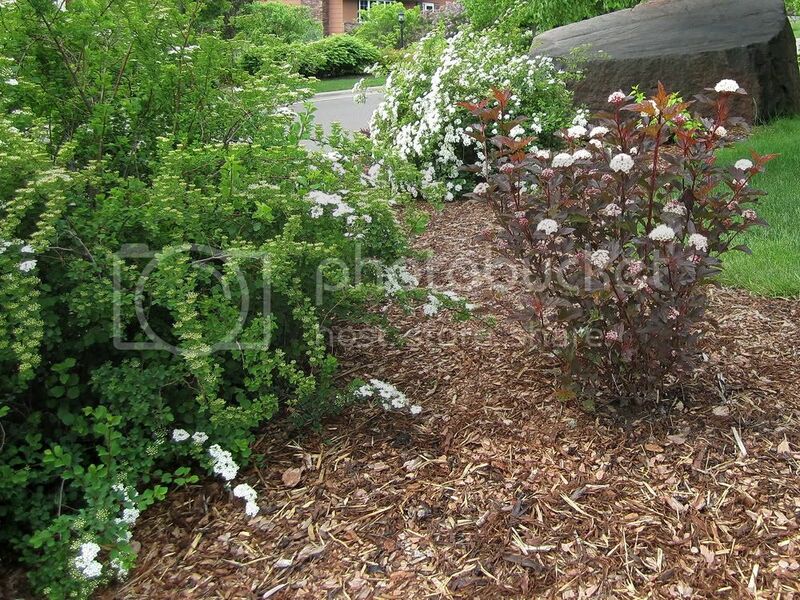 The rounder bush to its right is also a lilac, a later-blooming varietal called Miss Kim. Beyond it, not visible, is a dwarf Korean lilac. These have not yet opened at all, their buds still tiny and tight. Someone has put a lot of hard work into your garden - is that you by any chance? I really like the bark chippings (would like them in out garden but hubbie isn't keen) and what is the pretty purple flower in the foreground of the 3rd picture? They are in front of the irises. Ohhhh, how beautiful! It's so desert-y and not very green here except in the parks. That first picture of the trees.... heavenly. Yeah, but you have what we'd think of as summer almost all year! It is I who am jealous of you. Seriously, it is very pretty here during the time when things burst into growth and bloom. It's just so danged short. Dear Mechtild, would you mind friending me? I've never asked because I didn't know if you would mind that I sometimes write/post about slashy things. But I don't want to lose touch with your posts. I've been here five years, it's time I got over the shyness in asking these things. Re: friending. I used to friend everyone who friended me at the beginning, but I soon found myself browsing entries I had little or no interest in reading. Although I read a good deal of Frodo slash at the beginning of my immersion in Tolkien fandom, having become completely besotted with the eroticized version of Frodo I found in a lot of fanfic inspired by the films, most of which was slash, I actually have no interest in slash as such. But even apart from slash, people I friended years ago, people I knew from LOTR messageboards, who had nothing to do fanfic at all, have, over time, lost interest in Tolkien and LOTR. I still am friends with their LJ's, for old time's sake, but their LJ's are now about other fandoms and/or their personal lives. Which can be interesting, but not always. I'm speechless... Wow! It looks like paradise! You're a fantastic gardner. Be true - Samwise Gamgee is one of your relatives, right? We had no rain here for 6 weeks but now it's raining for almost 10 days and slowly, very slowly the flowers recover. It is rather paradisical, but bring a sweater! :) Today is lovely, but clouds will be moving in tonight. You had no rain for SIX WEEKS? What you live? I always thought of your part of the world as well-watered. The plants and trees must have had a devil of a time trying to survive. I'm so glad it's finally raining! 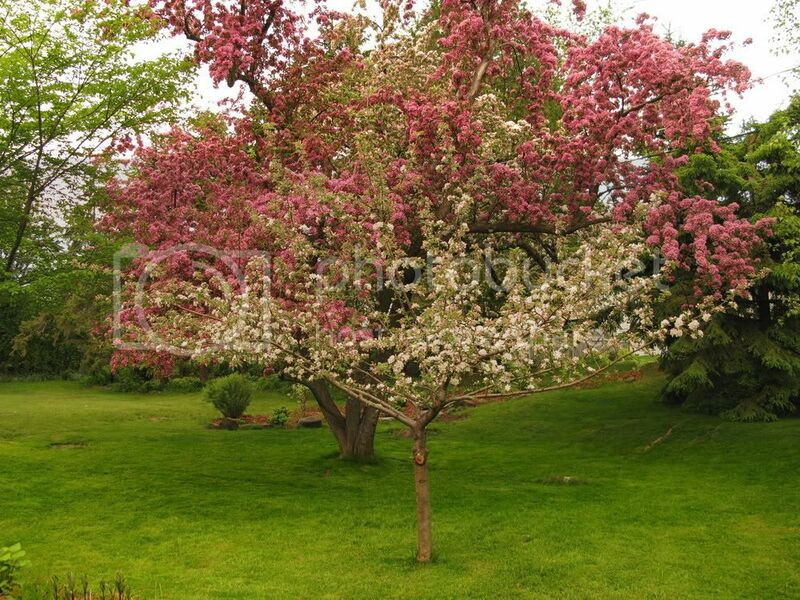 What gorgeous crabapple and apple trees - whoa! Showed my sister who every year has a little garden on our balcony of planters and hanging baskets. Curiously the baskets did not swing at all or very little during the terrible storm even though she says the rain was falling horizontally. Apparently the wind was hitting the other side of the building much more fiercely. Didn't use the balcony at all today after all since the sun decided to disappear again and the clouds reappear but have had some other glorious days out there and hopeful for more sometime. Oh Mechtild, your garden is gorgeous. The grass is so green! The only flowers I recognise are the iris. Mum used to grow them. It seems that we're not the only place where the seasons are becoming later and later. It's been a very mild winter here so far. However, on Friday night (of course, the first time we've been out of an evening in months), we had a downpour while we were on the road. It was a difficult drive. Thankfully it eased off by the time we reached our destination. We learned yesterday that we'd received 20mm of rain in a 10 minute period, and a total of 57mm in 6 hours (and nothing since)! Our garden is starting to look better - the grass is a bit greener and the compost has made the soil in the gardens richer. Flower seedlings and bulbed plants are emerging. I'm battling the weeds - naturally, they grow better in this weather! I've planted up the tubs with vegetable seedlings and yesterday I started preparing the back garden for potatoes. My muscles are complaining a bit, but it's a good soreness! Yes, it's very green. We can have dry periods in the summer when the grass gets yellow, but this spring it's been so cool and wet it's looked like photos of Ireland for months! Speaking of wet, I'm glad you got home safely the other night. I hate driving in a heavy rain, even if there is little danger of the roads becoming impassable. It's so hard to see! I've never lived where it snowed. I have always wondered, do you have to do much fixing up once the snow has melted? 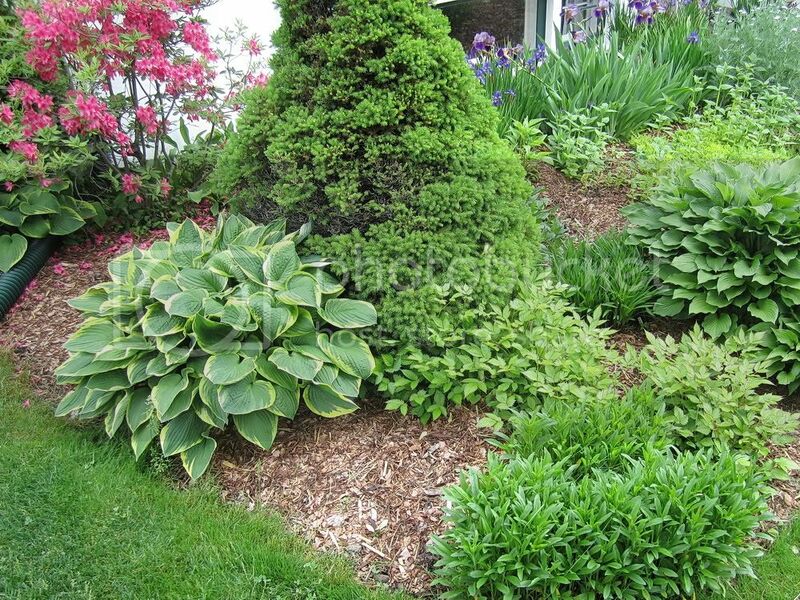 For example, do you have to go around and fuss over each plant and lay down fresh mulch over the ground? Or does it all just spring back by itself and the mulch is still good? I am also amazed at how quickly things green up once the snow melts. I remember one of my friends in Vancouver posted her yard full of snow one day, and a month later, there was green grass and flowers everywhere! It's amazing to me how fast it seems to come back. These are beautiful pictures. You have a lovely yard, Mechtild. Spring is fast in the north. This year it's been non-existent, or so it has seemed. Our spring has been like a New England March, but that lasted for months. But once spring arrives in earnest, it races by. The northern growing season is short. Plants need to flower and produce seed quickly. After the snow melts, yes, there is yard work to do. The yards typically look brown and matted and sodden after the snow, littered with old leaves and sticks that fall after the snow falls. They have to be raked. The mulch doesn't need to be fiddled with unless it needs replenishing. Ours did this year and it was time-consuming, wheelbarrowing the truck load of mulch I ordered, one wheelbarrow at a time, to the various gardens and beds, where I hand-spread a new layer. I don't think it will need new mulch next year, except here and there. It degrades over time, it doesn't last forever. Of course, some homes don't have much in the way of a lawn, either very small or completely landscaped with gardens and shrubs or wooded, so there's no raking to do, and some people don't use mulch at all, so there's no mulch replenishing to do. They just cultivate the soil before planting or adding emendments, just like people would do anywhere. To prepare for winter, I used to fill up plastic bags with leaves every fall, tons of them, and pile them over the beds and around bushes. That was time-consuming, and so was the removal in spring of loads of sodden, heavy bags of leaves (they always seem to develop leaks over the winter and absorb melting snow or early rains). I haven't done that for a few years now. I've just taken my chances. If there's plenty of snow early, there's no need to insulate most plants. The snow provides all the protection from wind, extreme temperatures and sun scald the plants need. It's like a thick blanket that protects them. But if there's no snow and winter gets deeper and deeper, a lot of plants may be lost. That happened about five years ago. Luckily, I had used the bags of leaves that year so I didn't lose much. But other people I know lost whole gardens of perennials, with much damage to certain types of bushes and trees. I'm so glad you liked the pics, Primula. But you have no snow at all? Do you live in southern CA, or maybe FL? Wow! 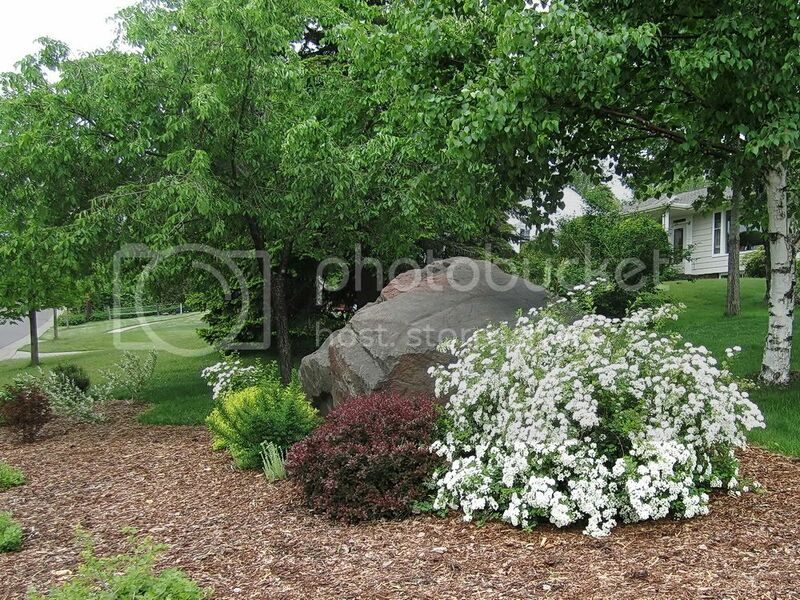 Your photos are stunning as are your lawn and flower beds. Our spring was very late this year, too, only about a week ahead of yours. I see you and I have many of the same plants. Our climates and growing seasons are so similar that it's logical the same plants would do well for both of us. I used to use bark mulch, but my plants are so close together now that I have no room for mulch. It does look beautiful though. Yes, I'm betting we have similar growing zones. This area is zone 3/4. Because we live right down by the lake, our yard is probably zone 4. If plants are sheltered, I can almost squeeze by with a zone 5 plant. Is that your about your zone, 4/5? Surely New Hampshire, even in the mountains, is not zone 3 - but maybe it is! You don't really need mulch even if there are big spaces between the plants, if you are willing to keep the ground weeded and cultivated. These beds look full when the plants are full grown, but there's this long period after the snow melts when the gardens are bare, or are dotted with very small crowns of plants, so the mulch does make the beds look more appealing and tidy. Down in the front of our yard along the street, just below where that big rock sits, we removed the grass and put in bushes, so there are really big expanses of mulch. But, hopefully, the bushes will fill in as they mature and the mulch will not be so visible. The grass down there always looked terrible, after the street project in 2003. They dug up the water and sewer lines down there. Putting the soil back, the infertile, rocky subsoil, pure clay, wound up on top, so nothing grew well down there but the hardiest weeds, lol. At least with bushes we could make nice-sized holes filled with good soil. What a lovely garden you've got, and so beautifully tended! Thank you for sharing the pictures of it. Minnesota is beautiful, but so, so cold, and the winters so long and dark. Bridal Veil is a very traditional shrub. No wonder it's still grown. It's so beautiful. Absolutely gorgeous! Thank you for sharing your delightful garden. You are welcome, Estë. It's coming along fast now. The sun's out again - two days in a row! (Around here, that deserves a woot woot!) It's still very cool, but it's supposed to warm up later this week to summer temps (in the 70's, up to mid-80's F for the high). What beautiful gardens--spring is always gorgeous no matter how late it arrives!